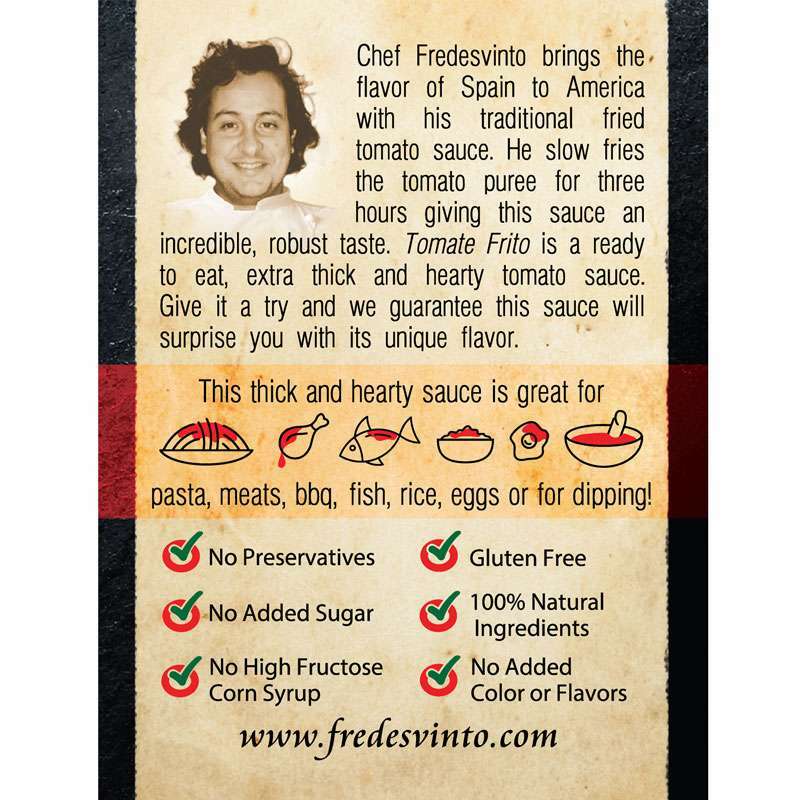 Chef Fredesvinto brings the flavor of Spain to America with his traditional fried tomato sauce. He slow fries the tomato puree for three hours giving this sauce an incredible, robust taste. Tomate Frito is a ready to eat, extra thick and hearty tomato sauce. Give it a try and we guarantee this sauce will surprise you with its unique flavor. FULL FLAVORED FRIED TOMATO SAUCE. 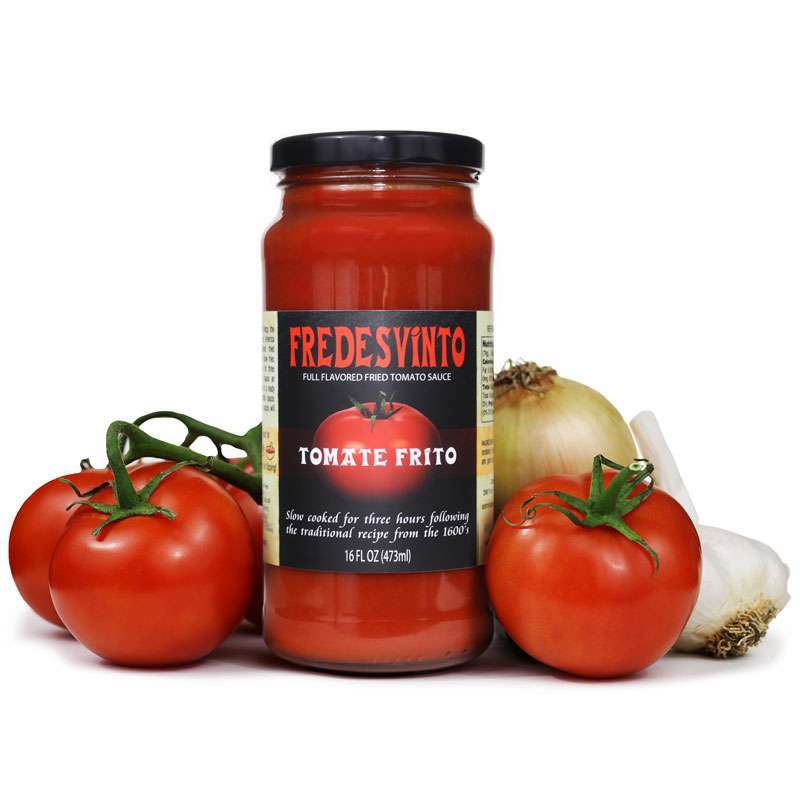 Tomate Frito is an amazing all-in-one artisan and homemade style culinary formula you can use instead the Marinara sauce for pasta, as a base ingredient or enjoy simply for its own surprisingly robust flavor. We slow cook Tomate Frito for three hours following the traditional European recipe from the 1600’s. READY TO EAT, EXTRA THICK AND HEARTY. If you are a pasta lover or rice enthusiast, this sauce is a must. It’s an extra thick and hearty sauce the likes you’ve never experienced. Tomate Frito is ready to eat. Just open the jar and enjoy your Fredesvinto Tomate Frito hot or cold. It’s delicious at any temperature. Size: 16 FL OZ (473ml) Glass Jar. 100% NATURAL INGREDIENTS. We only use 100% natural and healthy ingredients: tomato paste (fresh vine-ripened tomatoes), corn oil, onion, garlic and salt. That’s it. No preservatives, no high fructose corn syrup, no added sugar, no added colors or flavors and it’s gluten free. GREAT FOR EVERYTHING. Enjoy Tomate Frito with all your favorite recipes. It’s great for pasta, meats, BBQ, fish, rice, eggs or just get a French baguette and enjoy dipping. Its unique taste will enhance the flavor of your favorite meal. Everything is better with Fredesvinto Tomate Frito. FIRST TOMATE FRITO PRODUCED IN THE USA. We are very proud to introduce our delicious Fredesvinto Tomate Frito Sauce, an ancient recipe and the most popular sauce in Spain. 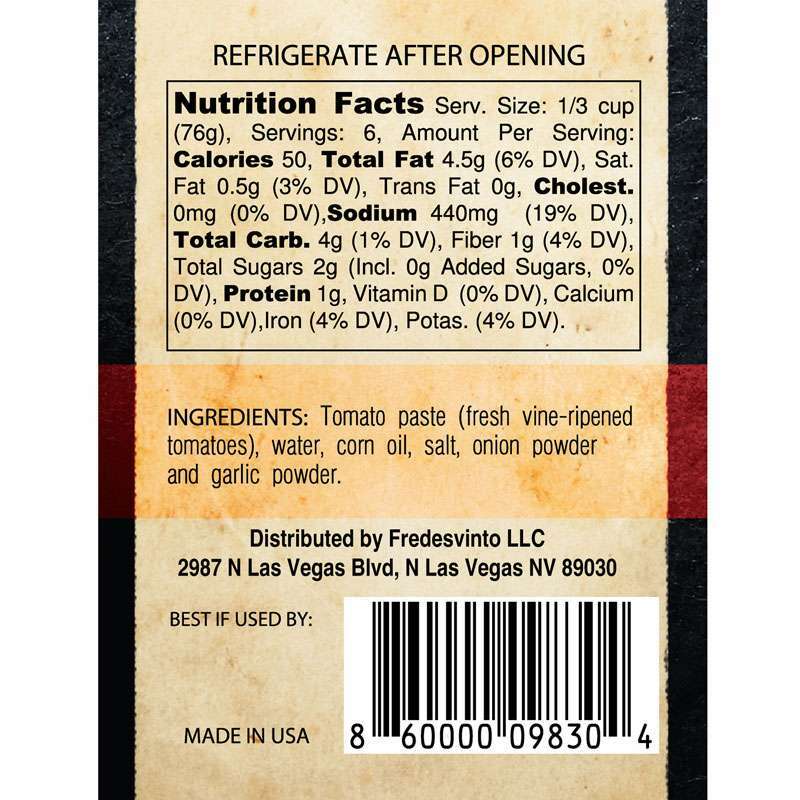 Fredesvinto is a family owned and operated American company founded by Spaniards and the very first company to produce Tomate Frito in the United States. Give it a try and we guarantee Fredesvinto Tomate Frito will surprise and delight you with its unique flavor. INGREDIENTS: Tomato paste (fresh vine-ripened tomatoes), water, corn oil, salt, onion powder and garlic powder.